What if you could deepen the connection among your team during the upcoming Christmas time? What if you could create magic moments, spark creativity and joy within your company with very little effort? Well, you can. Actually with very very little effort. Because all you will need for this, is downloadable in this blog. Let us share with you the Advent game we are playing at Impact Hub Zürich this year – maybe you’d like to spread that little spark within your own team. 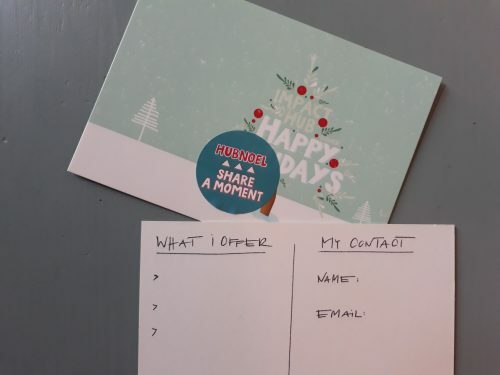 The game is called HubNoel – Share a Moment. It’s about the principles of our Co-Manifesto and the reflection of what we all have to give and to share – other than material things. We were overwhelmed by the number of participants for HubNoel 2017! 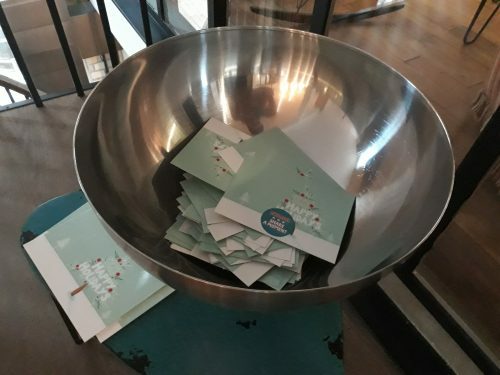 Each participant writes 3-5 things on a card that he/she can offer and drop it in the HubNoël pot. This could be anything from taking someone for a walk, baking a cake, giving a massage, offering tech advice, playing a board game, painting a portrait, fitness-instructions over lunchtime, cleaning someone’s bike, a conversation in a foreign language you know – let your imagination guide you and remember that we all have loads to give! Everyone contacts the person on her/his card and picks his/her favourite offering on the list. So each participant will contact a person; and, him/herself will be contacted by someone. You meet before Christmas to redeem your gift and deliver your offering whenever it suits you. Of course, you are free to use the timeframe that suits you best. Depending on how big your team is, and how often they are in the office, it may take a few days before everyone drops his or her card. We set a date and organised a little event with some nice sweets for everyone. For those who cannot attend, the pot will be displayed a little while longer, thus allowing everyone to draw a card. As an alternative, people may also write an mail to the organizer and ask the organizer to draw a card on their behalf; and, send the picture to them via email. We simply recycled last year’s Christmas cards. We asked the participants to make a picture/selfie during their shared moments and send it to us. We will set up a wall in a common room to display all the different magic moments. Be there! At Impact Hub Zürich, we simply recycled last year’s Christmas cards and hid the “2016” date by sticking a HubNoel sticker on it. If you have something to recycle, great! If you wish to use our templates for the cards, stickers and the poster with the rules, you are welcome to do so. We offer you all the data for Adobe CS programs and in each folder you will find a pdf version. Feel free to personalize it according to your needs. Just remember to please mention us somewhere. That will be our little Xmas present. Cheers! We wish you a wonderful Christmas time with your team, full of unexpected and memorable moments!